Reasons for concern: This plant is becoming a major weed problem. It produces thousands of tiny seeds that are easily dispersed far and wide by wind, and they can germinate over a very long period of time. It is reported to be resistant to glyphosate. It also contains allelopathic (toxic) chemicals that suppress the growth of nearby native vegetation. Botanical description: Erect, tall plant with many branches at top of stem. Leaves: Bristly leaves alternate, crowded on either side of stem. Upper leaves are lance-shaped to long and narrow. 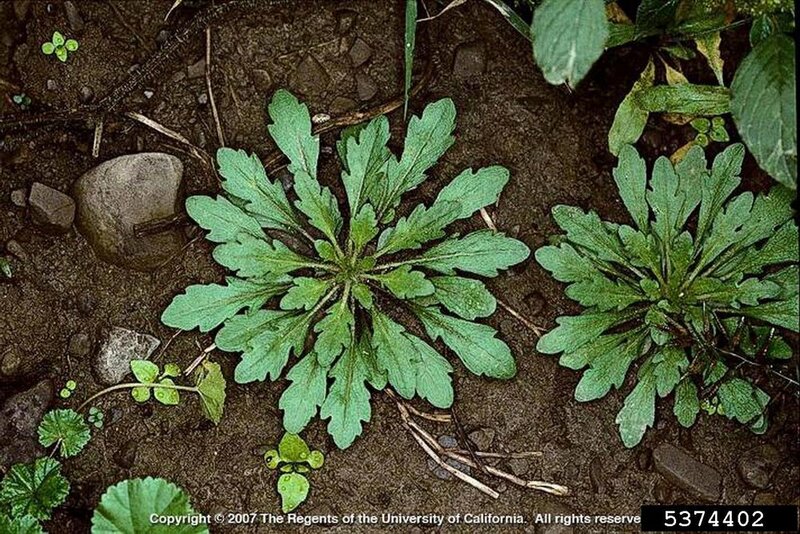 Leaves at ground level are spoon-shaped to long and narrow, arranged in a circular formation (rosette). Stem(s): Usually a single erect stem 1 to 5 feet tall. Sometimes several stems. Unbranched at the base but many branches above. Stem can re-grow after being cut. 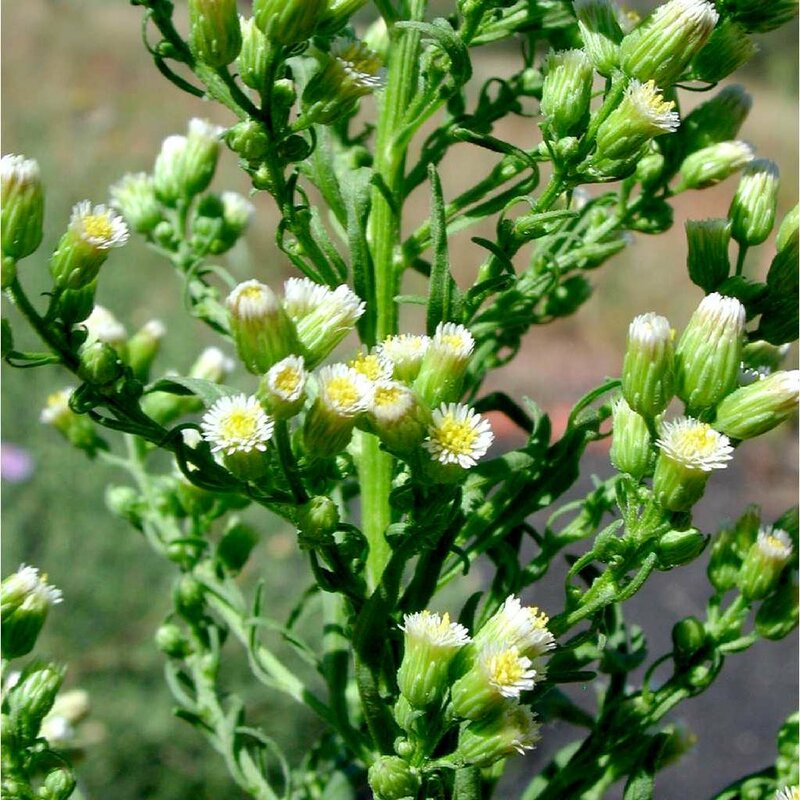 Flowers: Flower head (inflorescence) of many small, inconspicuous flowers with yellow center and white (sometimes purplish) ray petals, at top of stem. Blooms June through September. Seeds: Seed production June through September. Where it grows: Disturbed areas, waste places, pastures, roadsides at elevations of 900 to 8,200 feet. Likes sun. Widespread throughout North America. 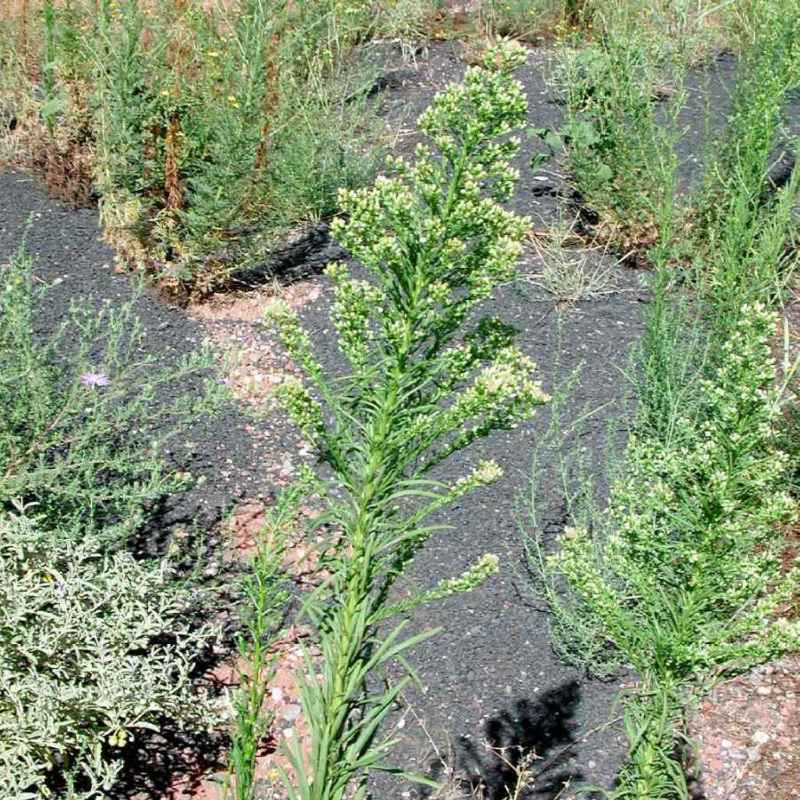 Weedy characteristics: Horseweed can easily take over disturbed areas since it seeds prolifically and spreads rapidly. It will re-grow if the stem is broken off. It also contains allelopathic (toxic) chemicals that suppress the growth of nearby native vegetation. Control strategies: Do not let them go to seed. Hand pull or dig out seedlings. Dig out more mature plants with the roots, but be careful not to disturb the soil too much. Step down any loose dirt to prevent seeds from finding a welcome environment to germinate. If you cut off stem or cannot get the root, check back to see if plant has started to re-grow. Plant desirable native species to outcompete invasive plants.